The one-day event “10 Years PET/CT – 10 Years Molecular Imaging” was successfully organized by the HYGEIA Group PET/CT Department on Saturday December 12, 2014. It was hosted in the N. Louros Conference Center, located within MITERA Hospital. The event presented all the latest developments of the technique, its benefits as well as emerging prospects. 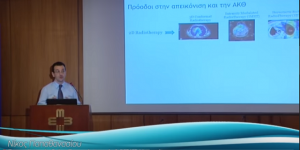 The scientific event also coincided with the 10-year anniversary since the first application of the PET/CT in Greece, at HYGEIA Hospital. Invited speakers both from the public and the private sector shared their knowledge and experience on this technique.